I don't like calling this section, "The Bad." Yet in terms of sticking with the typical PlanetDreamcast format, I shall. It should really be called "the Not as Good as the Previously Mentioned Stuff." 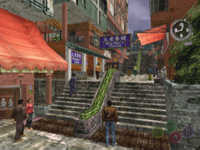 Some of the main problems in Shenmue II stem from things that were problematic in the first game, but were not remedied for the sequel. 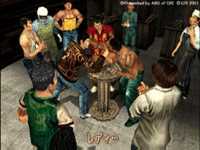 When I first started playing the original Shenmue, I found Ryo slightly difficult to control. It was strange, to me, that movement was handled more like Resident Evil than like Metal Gear Solid. I wanted to be able to use the Analog Stick to run, not the R trigger. Making slight movements felt unnecessarily difficult. But strangely, I soon forgot about all that. After becoming accustomed to the controls, I never again felt there was a problem with the control scheme at all. This same control scheme has carried over to the sequel, and similarly, it felt awkward when I first began to play. However, as before, I quickly became accustomed to the controls and never again had a problem. But if you are new to the series, be aware. You may find the controls unwieldy at first. They take time to master. If you didn't like the Quick Timer Events in the first game, you're still not going to like them now. They are back and even harder now than they were before. Luckily, in most case the game is very forgiving about the impact they have on the overall game. If you absolutely must complete a QTE correctly to advance, the game will let you retry the event as many times as necessary. Finding money early in the game can be tedious. There are several ways to make money such as selling items at pawn shops, gambling, and finding a part time job. Unfortunately, several of the part time jobs, which seem to be the most stable way to make an income, are based on games of chance. As such, there is really no way to perfect your skills and make a stable living in that way. I prefer the forklift driving from the predecessor as a source of income. Though it seems like mere nitpicking in light of the tremendous graphical achievment that is Shenmue II, it's only fair to note that there are a few shortcomings in its presentation. In some of the more detailed environments, it is not uncommon to see the framerate drop from its usual 30 FPS to somewhere near a crawl. Yes.. a crawl. These instances are not too common and usually only last for a few seconds, but they do exist. This may bother some gamers, yet I found it to be totally forgivable. Similarly, like in the first game, NPCs fade into the environments as Ryo runs past. This does tend to pull a little bit of realism out of the game. But to their credit, AM2 has been able to cut this down quite a bit from the original game. And also, it seems that more characters are able to be shown onscreen at once. So it's a small trade-off to make. I guess my final complaint is that the game is not going to be released in North America on the Dreamcast. As such, I was not able to use my existing save game from the original Shenmue. Though there are ways to convert save game files, I was not able to create a working one in time for the review. It's also really a shame that many Dreamcast gamers will miss this title, as it truly is one of the best that the system has to offer. But, to be fair, the future isn't all that bad either. The game is being ported to the Xbox which is a far more powerful system than the Dreamcast. All the graphical problems I've mentioned will no doubt be cured. And with an extra year of development time, AM2 may even significantly enhance the graphics and sound in the port. As long as they don't tinker with the plot or gameplay too, too much, we'll be in for quite a treat next Fall. I won't lie to you... I loved Shenmue. But as great as I thought that game was, nothing could have prepared me for Shenmue II. I looked past all the problems in the original game because, overall, it was such a fulfilling experience. The sequel is full of improvements that remedy many of those same problems and speed up the pace of the game. If you liked the original game, there is no doubt in my mind that you'll enjoy the sequel. And like me, you'll probably like the sequel more than the original game. If you didn't like Shenmue, I think it would be wise to give the sequel a chance. I'm not positivie that it will change your mind about the series, but AM2 has done nearly everything possible to accomodate the people who complained about the original without completely alienating the fans of the original. What it all comes down to is this: Is the game fun to play? The answer is "yes." It's a long and involving quest unlike anything before it (except Shenmue) that should appeal to both RPG and Adventure game fans. Though it would have been nice to see this game released in America, at least we now have an Xbox game to really look forward to. Sadly, this is the last new Dreamcast game I will ever play. But talk about going out with a bang... I couldn't have asked for anything more. Highs: Huge environments, fantastic graphics, immersive plot, long quest, Japanese voices. Lows: Some Graphical glitches, awkward controls, not released in America.